The Desktop Integration Package (DIP) may by default add to the Coveo unified index desktop/laptop computer files specified by your Coveo administrator. However, you can configure the DIP to take into account files that are located in other folders on your computer or in private network folders. You can also exclude specific folders from being added to the Coveo unified index. In the Coveo Desktop Integration Package Options dialog box, click the General tab, and then in the Remote Indexing section, ensure that the Remote server name for your Coveo Back-End server is entered. If you do not know this server name, contact your Coveo administrator. Note: The Remote Indexing section is often non editable because its parameters have been centrally configured by your Coveo administrator. In this case you have nothing to do. In the Coveo Desktop Integration Package Options dialog box, click the File Indexing tab. Below the Folders to Index list, click Add New. Select the local or network folder that you want to add. Desktop Integration Package 12.0.7914+ (October 2015) In the Folder box, manually type a folder path or paste one. 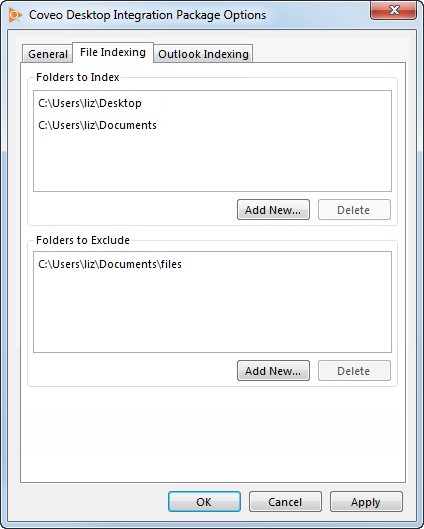 If the folder you which to exclude appears in the Folders to Index list, select it, and then click Delete. Below the Folders to Exclude list, click Add New. Click OK to return to the Coveo Desktop Integration Package Options dialog box. Note: When the same folder appears in both the Folders to Index and the Folders to Exclude lists, the content of this folder is not included in the Coveo unified index. Repeat the previous steps for all folders that you want to include in, or exclude from the Coveo unified index. Click Apply to confirm the changes, and then OK to close the Coveo Desktop Integration Package Options dialog box.